Increases all attribute defenses on the first turn. Wait until the effects disappear, dispel them yourself, or attack with a neutral special attack! 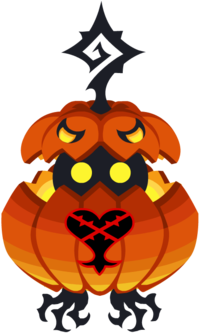 The Jack O' Lantern is an Emblem Heartless that appeared in Kingdom Hearts χ during the Halloween event in 2014. This page was last edited on 3 April 2019, at 17:45.